The concept of this thread is simple: post any kind of fakemon or original pokemon design that you're working on. This can mean spritework, hand drawn sketches, or just written ideas. Things like custom mega evolutions or regional variations fit in here too. First post!!! Anyway, I am here with a little sketch I did of an idea for a main legendary for my game. Here's the sketch! Baransura, the Split Spirit Pokémon. This mythical Pokémon is rarely seen by humans, and is said to have two distinct personalities. It is said to appear only once every century to keep the balance in the world, and each time it takes on a different form. Nobody knows it's true form, and so it is constantly represented differently in legends. It is an Aura/Flying type and Cipher uses it to unleash its dark personality and turn it shadow by naturally closing the door to its heart. I'll come back soon with some colored art for it and it's shadow form, but for now this is what I have! Feedback would be much appreciated! Oh, also, the name is a combination of balance and aura in Japanese, although I'd be open to any other ideas. 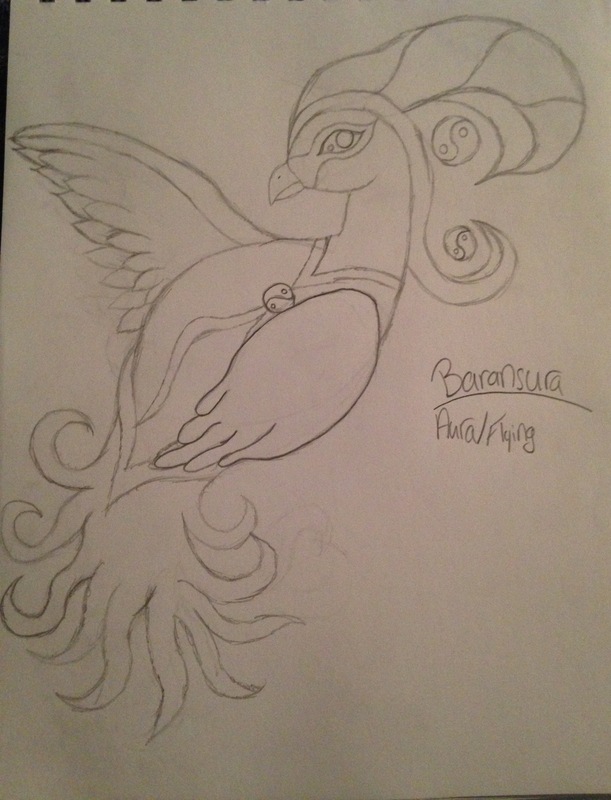 Baransura, the Split Spirit Pokémon. This mythical Pokémon is rarely seen by humans, and is said to have two distinct personalities. It isn't said to appear only once every century to keep the balance in the world, and each time it takes on a different form. Nobody knows it's true form, and so it is constantly represented differently in legends. It is an Aura/Flying type and Cipher uses it to unleash its dark personality and turn it shadow by naturally closing the door to its heart. I'll come back soon with some colored art for it and it's shadow form, but for now this is what I have! Feedback would be much appreciated! I really like how graceful and elegant it looks. One thing that bothers me is that it's a bird without any feet and birds have to land eventually, even if they're mystical spirit birds. If it did get some legs and feet, you could add a natural robe of feathers that help veil its lower body like a peacock. It looks nice overall though and of course that's just a suggestion. Oh crap I totally forgot to draw its feet! Lol. I'll make sure to add that when I finish it! Thanks for the feedback, and the robe is a great idea! -I'm not entirely sure what the large crest on top of its head is supposed to be. It'll probably be easier to tell with color, but as-is it kind of reminds me of a rolled-up leaf, and the extra lines going across it at that angle don't really mesh well with the long curves you have in the rest of the design. Seems kind of thick and a little top-heavy from this angle as well. Again, maybe with color or a bit more explanation about the concept it could make more sense, but if you're not attached to that particular crest, might I suggest several thinner feathers (like the long one curled underneath it) rather than one big one? -The yin-yang symbols floating behind its head seem random and kind of... blunt, I suppose?... rather than really contributing to the design. They give the impression that they were just sort of stuck in there because you felt like you needed to have more symbols somewhere, and less like an organic part of the pokémon. I like Raiden's suggestion of a peacock robe leading into the tail as well—since peacock feathers have those big, extravagant eyespots, maybe those would be a better place for additional symbols? That way it becomes a part of the peacock look (or just part of the feathers and design in general) rather than just being there for the heck of it. -It may just be that you were restrained by the boundaries of your paper, but the wings are a bit small. Given the flowy, elegant look you've got going here otherwise, I think Baransura would benefit from having longer wings as opposed to short, stout ones. Longer wings also give you a bit more room to play with color, or perhaps something with the yin-yang pattern (though I wouldn't go overboard with that; maybe a few small symbols at the tips of the primary feathers at the end of the wing, sort of like the suggestion for the tail eyespots). -While the pose you've got there does have a certain pleasing flow to it, it's an awkward way for a bird to twist its body. It's kind of like it's flying on its back rather than "face-down", as a flying creature generally would, or maybe like it's in the middle of a backflip. If it's not standing on the ground and actively showing off/trying to make itself look big, it's probably a better idea to keep the curve of its back mostly convex instead of concave. Try looking at articuno's sprites and other artwork for pose ideas—it's a legendary bird with several long, sweeping curves as well, and there are some nice examples of having its wings flared or in flight that could serve as inspiration for a design like this. Also, d'you think you could find a way to reduce the size of your scanned artwork before posting in the future? I know the new spoilers shrink the images down, but once you click the image to view the full-sized version it's still pretty massive, haha. I really like the concept overall, though, and I think it's got a lot of potential both visually and for your game. The design you've got and the yin-yang/balance theme leave a lot of room for interesting color placement and contrast, and Cipher presumably "throwing it out of balance" by sealing its heart seems quite fitting lore-wise. Looking forward to seeing the color version! -This was going to be it's balanced form, one of three forms. I was thinking of maybe redrawing this with consideration to all the feedback I've gotten, and I was going to add maybe some more gold around its body to look almost as if I thought is restrained and especially around the feathers on its head to make it look like it was held back like hair. The corrupt shadow form would have the feathers be released and be all over the place, kind of chaotic. It's other form would be its pure form that would take on a very light/heroic side. Perhaps it's balanced form could show maybe half and half? I'm not too sure yet on what I want it to be exactly. -The feathers on its head was supposed to be long elegant feathers that more represented long flowing hair and the twists were different colors, but I will probably change it to the thinner feathers you mentioned. -Yeah I kind of just added those yin yangs to give it a more mystical feel as those were going to be floating as if compelled by a psychic force. I agree they look kind of random and I really like the idea of adding them to the tail feathers like a real peacock, so that's probably what I'll do. -Yup, the wings were due to the restrictions of the paper since I started drawing a bit too big, so this next time I draw it I'll try to draw it all a bit smaller to fit it all onto the paper. -And lastly I'll make sure to keep the images smaller, I took it on my phone and not my scanner so I didn't realize it wouldn't be that big. Sorry about that! Again, thanks so much for the thorough feedback, I think I'm going to try redrawing it soon, so I'll try to incorporate a lot of the things you said! Hell yeah, mediocre art time. These little buggers are pretty old, but honestly the best Fakémon I've made, IMO. Koalit: The Ember Koala Pokémon. Koalit love eating charred leaves, which they light on fire with the small flames they can emit from their furs. People have commonly seen them twirling around branches, training for their evolution. Koalava's flames are much bigger from when they were a Koalit. As a weapon, they use tree branches and set the tops of them alight. Seeing a Koalava twirl its flame branch is a beautiful sight. I hope you like these Fakémon, cause I was pretty proud of them when I drew them. @BritishYoshi Hey, those are some pretty solid designs! I do have a few suggestions, though. First off, I think that perhaps some of their features could be exaggerated a little more to solidify them as Koala Fakemon. At the moment, to me they look like bears and don't really strongly convey that they're Koalas. I'd try maybe making the nose larger and more of an oval shape and also making the ears larger and rounder since those are common characteristics of cartoon Koalas (at least they are for me :P). Maybe look at Komala as an example of what I mean. I also think that maybe the grass typing could be justified a little bit more if the final evolution had a few burning leaves as part of it's actual body, like maybe on it's arms or in it's neck fur. Speaking of the fur, I really like how full and fluffy it looks, I think it really conveys fire and makes it feel like a fire type without actually being fire! :D so overall, I think it's a pretty solid design, and with just a few little changes, it could be even better! Thanks! And yeah, they do look less like Koalas than they should. I'll take this advice, thanks! @British Yoshi I like how your creative idea for Fire/Grass Pokemon! Some feedback I could add is to edit their eyes so it's not a single dot even though koala's eyes are small. Also using torch as weapon is quite common already (tail torch). How about a flame whip instead? 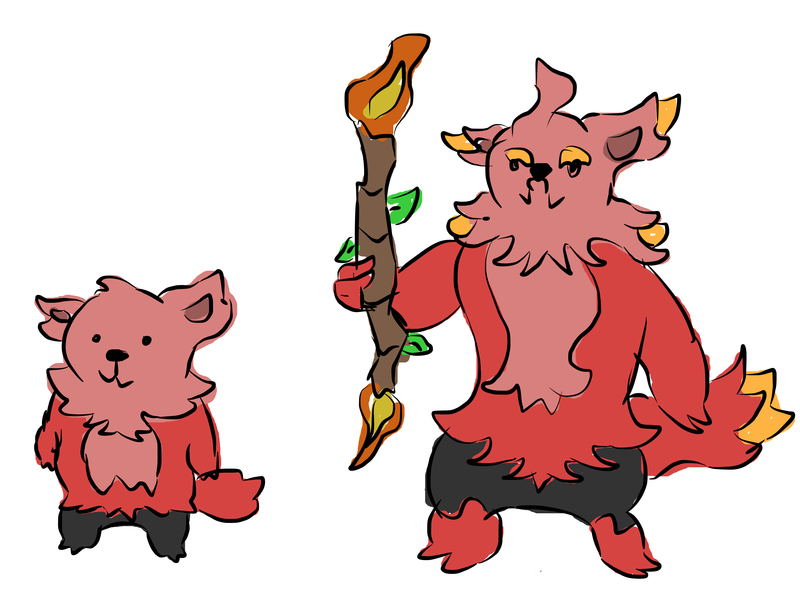 That way Koalava could utilize Fire Lash and Power Whip, both are solid moves. Give it new ability that works like Simple but for opponent only and Parting Shot and we will get an amazing move combination. I even could think of moveset consist of Fire Lash, Power Whip, Parting Shot and Slack Off. Oh, wow, I really like those!! I think you did a fantastic job of making them distinct from one another (all different faces, different color focus... they don't "just get bigger" or change only one element!) and I love the progression of their backs from small sprouting grass to large stalks to what looks like an entire mountain range. I think that even though you "just added plants," the clear progression of those plants makes up for it well enough! I'm with Hematite—I think the plants are handled quite well, with an interesting and logical progression that keeps them from looking samey (though I might try playing with the shade of green you use for the leaf-plates on each stage so they stand out a bit more from one another). Honestly, I think the room for improvement lies more in the "animal" than in the "leaves". The final stage especially is very much like a real stegosaur, and most pokémon don't copy their real-life inspiration's body structure quite so accurately. I'd suggest you try experimenting with the sizes and shapes you use to construct each stage: what if the body was rounder, or the head more like an exaggerated triangle, etc.. I find it's always helpful to doodle lots of little thumbnails before moving to the final piece, making different parts of the body more "weird" or less "weird" in turn, just to see what sorts of interesting shapes and configurations come out of it. It also helps me decide whether I can draw inspiration from one part of a design and repeat it somewhere else. For example, it looks like the final stage's feet have clumps or earth or maybe little rocks around them, sort of matching the mountainous plates on the back. What if you exaggerated those stones a little more, had them make up more of the legs than just part of the bottom of the foot, even made the legs thicker and sturdier and good for some serious stone clobberin'? That kind of experimentation generally leaves you with a lot of ideas and tweaks to explore, and when you choose the ones you like and put them together, you end up something that looks like a stegosaur without being "just a stegosaur", and something that makes good use of all the elements that make up its design. This is definitely a good start, though! I like the first stage especially. It's very cute and starter-y, with adorable, childlike proportions that are still different from the way a real baby stegosaur would have looked and so make it its own thing. Nice work! @Roenais Hey, overall I think those designs are pretty nice. It's actually kind of surprising when you say that you're new to designing Fakemon! About the point you made about just sticking leaves on an animal and calling it a grass type, I totally know what you mean. I find that happens to me a lot when I'm making a grass type Pokemon that's not explicitly a plant, but honestly it's kind of what you have to do to make a Grass-Type Pokemon l based off of an animal. However, I think maybe to make your deigns feel less like that, you could try to incorporate the leaves into the dinosaur's body a little more. I'm kinda stumped on just how that could work though to be honest, but I think the tail could be redesigned slightly to be more of an actual concept rather than a normal tail with some leaves on it. Maybe take some inspiration from Bulbasaur and have the tail be an actual plant, with each evolution having a different stage of growth. I also think it might be nice to have less leaves on the Fakemon's back, and just have 3 or 4 instead. I think it would be nicer if the leaves were larger and more stylised. So, I'm not much of a Fakemon designer, more of a spriter, but I've been attempting to get the style of them down more. So, this is my pathetic attempt at a grass type starter based on a Komodo Dragon. @LlamaMinister Really nice job on the Sprite work as always! Can't really fault that, but I do have a few tips on the actual design of the Fakemon. First off, I think it looks a little too developed to be a basic stage Pokemon, especially for a starter. Starter Pokemon to be quite small and compact, but your Fakemon is quite long, and has a completely separate head from its body. That last part sounds super weird, but I've noticed that starter Pokemon, in the interest of making the compact and cute, tend to have heads that sort of run into their bodies. They're not so separate as the head of your starter. I think I'd also suggest doing something to make it scream 'Grass-type' more, since at the moment it doesn't really come across as being that type. Yeah, I'll admit it doesn't really look like a grass type. After posting, I realized I should have made the horns twigs. And he is a little long, too. However, I personally would disagree in the head being separate as a problem. Some starters do have heads that run into their bodies, yeah, like Chikorita, but things like Chimchar and Treecko, don't really have that. But I really do appreciate the feedback, and I'll try to fix those two other problems! A fair amount of Fakemon I've sprited. Definitely going to redo Oozomaki and Franknsliem; they were some of my first sprites, and it shows.